Focusing exclusively on the older patient with poor bone quality, this unique book presents the indications, contraindications and common techniques – as well as the risks, benefits and outcomes – for utilizing arthroplasty for the treatment of fractures in this population, sensibly divided into four thematic sections. The incidence and burden of fragility fractures is presented in part one, with considerations of the influences of osteoporosis on both treatment and healing. The subsequent three sections cover upper extremity fractures, lower extremity fractures, and peri-articular nonunions, respectively. 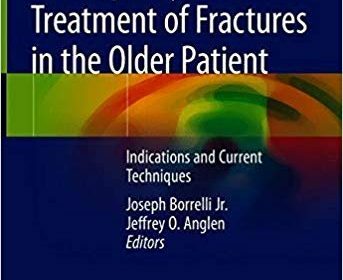 However, far from providing a simple “how-to” for the techniques discussed, the relevant current literature is presented as well as the common techniques employed in fracture management, allowing the reader to select the best approach for the specific patient presentation. In addition, chapters are included here that cover degenerative joint conditions not typically treated with total joint replacement. The treatment of fragility fractures is constantly evolving, and the aging population is consistently expanding, creating a strong need for clinicians who have experience with and exposure to the use of arthroplasty techniques as an option in their successful treatment. Written and edited by leaders in the field, Arthroplasty for the Treatment of Fractures in the Older Patient is an invaluable resource for orthopedic surgeons, residents and support staff who see and treat these increasingly common injuries.